There's this weird stigma that snacking is bad for you, and we're here to clear that generalisation up for good. Yes, snacking on a bunch of unhealthy foods and sweets is not the best for your body. I mean, too much of anything is never a good idea. However, there is such a thing as healthy snacks that you don't ever have to feel bad about indulging in. 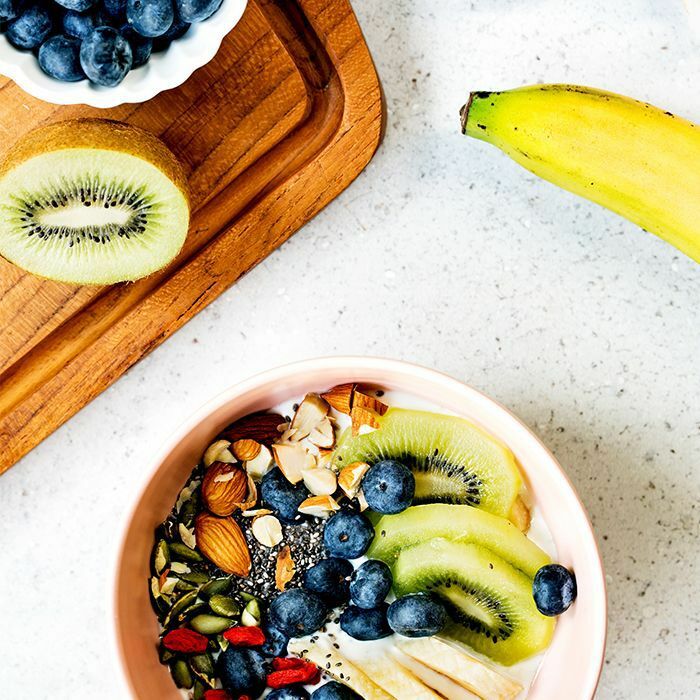 It's actually good for you to keep protein-packed snacks around to do things like speed up your metabolism, energize you more, and fight unhealthy cravings. We decided to call on who knows best when it comes to low-carb snack ideas: expert nutritionists. Consider adding these healthy choices to your next grocery list. Keep reading for the best low-carb snacks to keep in your bag at all times. "I'm a huge fan of nuts," says Amy Shapiro, NYC-based registered dietitian and nutritionist. "Not only are they full of fiber, which keeps you full, they also keep your heart healthy fat. Nuts keep cholesterol at bay and also help keep you full because they're full of vitamins and minerals. I particularly love sprouted nuts as they are easier to digest, and you absorb the nutrients more efficiently. Remember that nuts are calorically dense, so stick to one portion or a small handful." Raised Realco-founder Michelle Davenport, RD, PhD, loves nuts, specifically almonds. "These are packed with protein (5 grams per 1/4 cup) mono-unsaturatedated fatty acids, which keep you feeling full without weighing you down. Just remember to stick to 1/4 cup or a small handful," says Davenport. Jonathan Valdez, registered dietitian and owner of Genki Nutrition, recommends trail nuts. "Essentially when you think of nuts, think heart healthy," Valdez says. "Nuts are an excellent snack to have that doesn't require refrigeration and is easy to carry around. Mostly importantly, nuts are plant-based for those who are vegan or vegetarian. "They're full of fiber, which helps prevent constipation, and contain other essential nutrients like B vitamins for energy metabolism, vitamin E for antioxidants, and calcium to help keep your bones strong. Other nutrients include iron, zinc, potassium, magnesium, selenium, manganese copper, and phytochemicals." "Everyone thinks of yogurt as breakfast, but I love it for dessert," says Shapiro. "Greek yogurt is high in protein and low in fat and sugar, as long as you get the unsweetened kind. It'll keep you full for a few hours, making it a great snack. I also recommend sweetening it with cinnamon and adding some chia seeds for extra fiber, calcium, and staying power. It's basically low in carbs, high in flavour." Registered dietitian and author of The Diet Detox Brooke Alpert is all for pumpkin seeds. "While seasonally appropriate right now, these little seeds are great year-round," says Alpert. "They are actually packed with protein (1 ounce has just over 8 grams of protein—more than an egg) and loaded with fiber, making them a perfect snack or even a meal topping. I love them on spaghetti squash. They are a great source of magnesium and zinc." Alpert also recommends jerky. "When you find a good grass-fed beef jerky, you've found a great snack for any time of day," explains Alpert. "The protein keeps you full and satisfied until you can get to your next meal, and the fat that grass-fed beef has more healthy fats than traditional beef. It's also a great source of conjugated linoleic acid; this type of fat is known to have great heart health benefits." Valdez agrees. "Beef jerky is an amazing snack that comes in various flavours and nutritional value," says Valdez. "One ounce serving contains about 116 calories, 7 grams of fat, 3.1 grams of carbohydrates, and 9 grams of protein. It's high in protein, which is especially great for working out during strength or power training to maintain muscles. It also contains iron, which is a nutrient of concern for Australians, especially for adolescence, pre-menopausal woman, and woman who are pregnant. Iron is important for growth, development, normal function of cells, and creating some hormones." "This is an amazing snack that packs tons of nutrients," explains Valdez. "One large egg contains 70 calories, 4.5 grams of fat, 0 grams of carbohydrates, and 6 grams of protein. Within those 70 calories, it contains 13 essential vitamins and minerals, including selenium, riboflavin, and naturally occurring vitamin D (most foods don't have vitamin D). One large egg also contains choline, which is essential during pregnancy for supporting brain development in the fetus." Once boiled, it can last up to a week in refrigeration. But of course, the sooner you eat it, the fresher it will be. Just remember if you're on the go, because the boiling process can make a hard-boiled egg vulnerable to bacteria, which can cause illness." Davenport also suggests eggs as a healthy alternative. "At 75 calories and 6 grams of protein, eggs are the perfect low-carb food," explains Davenport. "They have a little bit of every nutrient we need, including choline to fuel the brain. Bonus points if the eggs are pasture-raised with omega-3." "I always recommend seaweed snacks like SeaSnax," says Shapiro. "They are simply toasted seaweed in a variety of flavours. They're super low in calories and carbs, but they fix any salty craving you might have instead of a pretzel. They are also high in iron, fiber, magnesium, folic acid, and vitamin K."
Up next: Check out the best plant-based proteins even non-vegetarians should eat.